On our journey to financial freedom we have looked at every single category in the budget to get it to the lowest price possible. I would always skip over the power bill. My thinking was along the lines of “it’s power, gotta have it” and that was about it. I also like a good budget challenge. 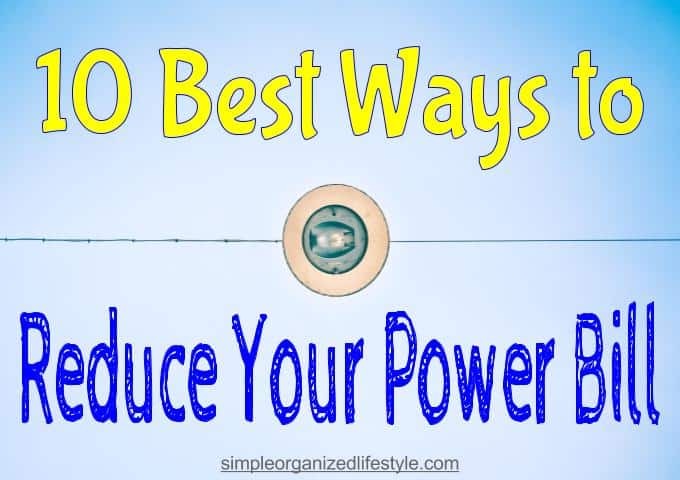 I started to research and consulted with family member above (who was not as enthusiastic about my new goals) who confirmed all of my 10 best ways to reduce the power bill would work. In no particular order, here are the tips we tested for several months to see between a 10- 20% decrease in our monthly power bill! Every cent saved means one step closer to financial freedom so we’ll gladly change our habits to see these monthly savings! Constantly moving the heat or ac to different temperatures makes your heating and air unit work harder and uses more energy. Set the thermostat to one temp and leave it there for the best results on your power bill. For us, staying at either 74 or 76 through the year is comfortable. If you’re not using it, unplug it. This is easier when there are several appliances on a surge protector that you can unplug at once. Usually, if anything has a light or clock on it, it’s using power. Obviously if it’s something you use daily, this might not be worth the hassle. But if you have something that’s rarely used, simply unplug it until it’s needed. Change your incandescent bulbs to LED lights. We have slowly but surely been changing out every light in our home to LED. The benefits are not only savings on our power bill, but they will last much longer too, saving on time and maintenance. Consider using the grill to cook or a crockpot to make a meal that you’ll eat several times throughout the week. You could also batch cook and freeze meals that are ready to go. That’s both a time and money saver from using the oven less often. Let your clothing air dry outside or use a drying rack. A drying rack is an excellent way to see big savings on your power bill. Anything in your home that pulls heat…the microwave, oven, hair dryer, clothes dryer etc. is a huge culprit of a high power bill. Check out this cool energy use calculator to see how much an appliance, like the clothes dryer, costs you daily. If you can limit the use of those big appliances, you will see significant savings. If you can invest in a more energy efficient hot water heater, that will give you a great long term return on investment. If that’s not an option, reduce your hot water heater temp. We did this when our son was big enough to turn on water by himself out of precaution and haven’t missed the hotter water setting at all. This is typically the first thing that comes to mind when saving on a power bill yet it’s something we easily forget. One idea is to put a reminder near the light switches that get turned on the most. You may find that you don’t really need the lights on until night. Improving insulation makes it easier for your home to maintain a set temperature. This was a project for us last year in our basement and we saw immediate improvement on our power bill and the temperature in our home. I love natural light so I’m always opening the blinds and letting the light in. But when we’re at work, through the hottest part of the day, it really makes more sense to close the blinds or curtains to reflect sunlight and keep our house cooler. Wash dishes by hand when you can and skip the dishwasher to save on energy. If your dishwasher has a heated dry setting, turn it off and let the dishes air dry. You can speed up the process by opening the door and placing any dishes that are still wet in a dish drainer on the sink or a microfiber dish drying towel . In the future, we’d really like to explore some solar panel options. Until then, these changes help us save between 10-20% each month on our power bill, and they can do the same for anyone. Those who are very strategic and disciplined about reducing energy use could see major savings when it comes to the monthly power bill. Please let me know if I left something out! What tips or ways do you save on the monthly power bill? When we remodeled our current home we used all LED lights and of course increased our insulation. What a difference that made! The LED lights really pay off in the long run! I agree. We are almost all switched out to LED and I like them so much better for the long run savings and because they last so much longer! That’s great your company offers an incentive like that! Tell the kids they can split the money and that might be more motivation, ha!